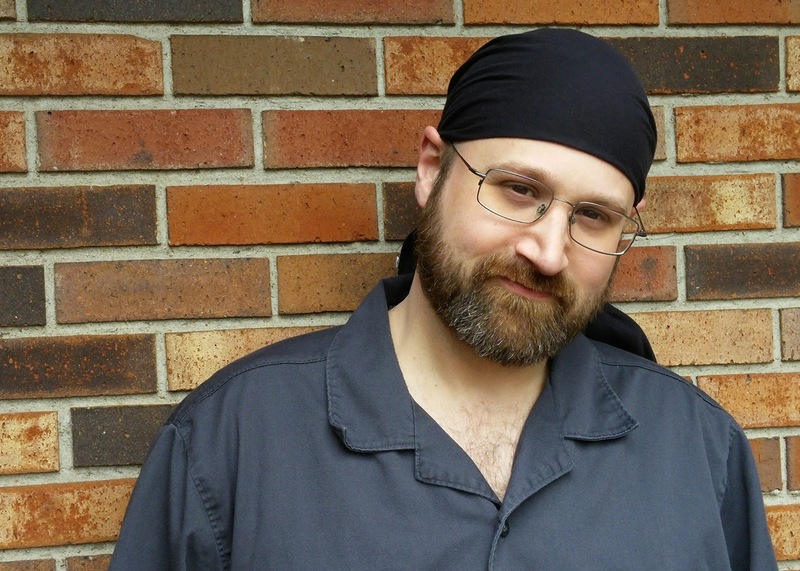 An awesome interview with Jesse Teller, author of The Manhunters series. 1. Could you tell us about Song and Hemlock? What differentiates them from other fantasy? Song is about a prison break. It tells a story of a maximum security prison in a fantasy world that is broken into and the inmates freed, all of them. They are recruited into an alliance poised to destroy the world. There’s a man who blames himself for this prison break, and sees it as his personal responsibility to bring these people to justice. So he gathers together his close friends, the most powerful people he can muster, and he goes after them. It’s different from other fantasy because it has a crime story element. It talks about prison, but mostly it’s about friendship. The people who are going to connect with this book the most are people that either enjoy a relationship with close friends or that long for one. 2. Who are the protagonists of the series? Every one of The Manhunter books has the main story of the book, which is the story of the crew rounding up the criminals. But also there is always a secondary story. In the main story, the protagonist is an ancient wizard, still young by his race’s standards, but ancient by ours, named Rayph Ivoryfist. Rayph has many flaws, but at his heart, he shares a certain responsibility that says if you can do something to help, you should. If you’re in a situation where darkness is prevailing, and you can stop it, it’s your mandate that you do. Rayph is intelligent and powerful, and he’s a good man. In Song, there’s also the secondary story of Konnon. Konnon is desperate. His daughter is very sick. All of his money goes to medicines for her, and the only thing he’s good at is sword fighting. 3. What are they looking to accomplish? In each book of the series, the Manhunters find themselves locked in a struggle against a particular villain. In Song, that villain is Julius Kriss. Julius Kriss is one of the deadliest men in the world. He has a sword that banishes everything it kills to Hell. He has a demoness wife. He is in every way a nightmare to hunt down, and it will take planning and luck to bring him to justice. In Hemlock, the Manhunters face a hive of vampires. In Crown, a crime syndicate. In every one of the books, the Manhunters are pressed for time, pulled to the extreme, and pressured on all sides. 4. How did you come up with the idea for the books? This entire series, and the Manhunters as a crew in general, was inspired by the movie The Fugitive. I tried to put together a force similar to the U.S. Marshals, but in a fantasy setting. Tried to figure out, if I was in a fantasy setting hunting down a fantasy villain, what would I need? How many different tools would I need to bring to bear? The answer I came up with was a wizard, a warrior, a spy, a holy warrior, and a witch. As the series goes on, and the villains become more and more powerful, Rayph is forced to bring in more and more tools, introducing new characters with new abilities and unique personalities. 5. One of the chief conflicts you have is the king versus the wizard who safeguarded his kingdom for millennium. Is this inspired by Denethor and Gandalf? No, this is not inspired at all by Gandalf and Denethor. It’s inspired by a manager of Pizza Hut between the years of 1998 and 1999 in the city of Springfield, Missouri. He was a bit of a tyrant. He was ill-prepared for his job, came to work drunk. I was an employee for seven years, and I knew how the store should run. He and I went rounds about work schedules, cleanliness, product ordering, customer service, everything you can possibly imagine, and in the end, I couldn’t work with him anymore. I would like to say that Phomax and Rayph have such noble background as Gandalf and Denethor, but if I’m telling the truth, it’s Jesse Teller and his incompetent manager at a pizza joint. 6. What inspired you to do these books? I have a lot of story to tell, stories I’ve been working on since 1994. They feed off of each other. They overlap each other. One day, at the end of my career, people will be able to stand back and look at all of it. The work inspires more work. I tell my friend this all the time. We get together and talk about art and writing, and I’ll tell him that writing one project inspires the next. You leave a strand untied in one story, follow that thread into a completely different one. The work inspires the work. The more writing you do, the more you have to write about. Every word you write builds on the next one. I’m not as inspired by stories I hear and things I see as I am by stories I’ve told and the places they lead. 7. Who are your influences as a writer? So, first on this list has to be Stephen King. I was reading King before I should have been. I was raised on his legend. My mom used to talk about Stephen King all the time. When she found out I wanted to be a writer, she kept talking about him. He was her favorite writer. In sixth grade, I picked up Edgar Allan Poe and my world exploded. Me, in a corner, with Poe and a dictionary. Changed the way I looked at everything. When I got older, it was Robert E. Howard and his magnificent work. You could smell the sweat on the page, feel the humidity of the jungle in the room with you. Shelley and the doctor, Bronte and Heathcliff, Lovecraft and Cthulhu. This is where it all comes from. As I move through my writing career, I find that I draw more and more inspiration from the classics. That’s who I want to write like, and most of the time that I read, I spend reading them. I’m pretty excited to be venturing into the world of Faulkner soon. As soon as I can work up a timeline for when I should be reading what, I’ll plunge into that. 8. What inspired you to go self-published as an author? What advice do you have to give other authors about such? It was the rumors about the publishing world that turned me toward self-publishing. I had a lot of books written by this time, and I knew that for every series I had written, every book that I wanted to write, I would have to give a pitch. It chaffed me, the idea that I would have to ask permission to tell a story that takes place in my world. The very idea incensed me. Once I had written 15 or 16 rough drafts, and they were just waiting to be published, I realized that my publishing schedule would need to be swift. I would need to be able to dictate exactly when a book came out, no delays, because each book led to the next, and I had a lot of words just sitting around. I needed to be able to dictate the timeline and the deadlines for each book. I heard a story once about a writer at a book signing and a reader walked up to him, named off their favorite character, and said he should do a spin-off series on that character. That writer said he would have to ask permission from his publisher before he started developing that. After hearing that, I knew the system was broken. In order to do the kind of things I want to do with my career and my writing, I need absolute control, and the only way to get that is by self-publishing. My advice to any self-published writer is the same as my advice to any other writer. Write all the time. Like I said earlier, the work will inspire more work. If you train your brain to create at a certain time of day, every day, for a certain length of time, then your muse knows where to find you. They’re not waiting at the keyboard looking around for you. So pick certain hours of the day, go to your keyboard every day at those hours, and write, because in the self-publishing world, if you publish one book, you may flair popular for a while, but just like in any entertainment market, that flair won’t last. 9. How has response to your books been so far? Response to my books has been pretty positive. I’ve got a 4.1-something rating on Goodreads with six books out, and a hundred and twenty something ratings. I’m on Amazon with 77 ratings, and an average of 4.3. People are liking the work. The books before the Manhunters series were pretty much standalone books. They could be read in a certain order, but pretty much they were standalone books. The Manhunters added to that. The more books come, and I publish twice a year, on April 15th and October 5th, the more books come, the more overlapping the stories will have. All of my books are based in the same world, characters from each series or each standalone appearing in many others. For instance, if you read Song and enjoy the character Konnon, you can find a short story about his origins in a short story collection called Legends of Perilisc. If you want to know why Rayph and his king are at odds, you can read Liefdom: Path of the Monstrous Prince, and find the details of that story. In Hemlock, a character is introduced named Saykobar. His origin story is also in Legends of Perilisc, and we get more of him in Mestlven: Wrath of the Jeweled Lady. Everything is connected. If you’re reading about something in one of my books and you think there might be more story behind the story, most likely you’re right. 10. Would you recommend any other traditional or indie authors to our audience? Okay, so, traditional authors you can find on your own. I’m less excited about them because I have little connection with them. They don’t answer my calls. Mark Lawrence is really big on the indie scene even though he is a traditional writer. He helps us out a lot, and I have a lot of respect for him, and I’m very grateful for things he does for us indies, like his SPFBO contest and the reviews he does. But I get more excited about the other indies like me. You’ve got M.L. Spencer, and the exciting stuff they’re doing with the Rhenwars Saga. It’s brilliant work. Look into it. You’ve got C.T. Phipps writing about dark powers and evil knights in his Wraith Knight series, as well as weredeer and vampires in his United States of Monsters series, yes, I said weredeer. There’s something twisted about Phipps. Look for Frank Dorrian. He’s an up and coming god. Watch for Rob Hayes. The stuff he’s doing with his First Earth saga is groundbreaking. That man can’t be stopped. If you want a breathtaking, meticulously created work with history and backstory, look for Damien Black. Dyrk Ashton and his gods, Paul Lavender and his orcs. Dale Triplett and the mind-blowing journey of the man with the M&Ms. There are really good self-published people out there. If you look hard enough, you’ll find them. 11. The sequel, Hemlock, has just come out. What can you tell us about it? Hemlock introduces the character Aaron the Marked. It’s the first we see of him in any of my work as it’s been published. To date, including the rough drafts I’ve written, Aaron is in twelve novels. His story is one of the most important of my world. He is intricate. He is complicated. He is emotional. And he is focused. He’s damaged. He loves hard and hates harder, and he blows up the page. I feel like with Hemlock the story is beginning to be told, that everything before Hemlock has been foundation work, but now we’re getting off the ground. Hemlock introduces a lot of characters that become pivotal in other books. The world is beginning to be shaped by the cast in Hemlock. It’s a must-read if you’re going to understand the inner workings of the continent of Perilisc, where the books are set. Okay, so Crown is written. It’s done. Crown is the third book in the Manhunters series. It’s with the editor right now. It’ll be out October 5th, 2018. It’s an exciting book and goes into a lot of things I haven’t had time to look into yet. Since the Bible, and Dante’s Inferno, there’s been a conversation going on between artists, writers, sculptors, historians, about Hell and its landscapes. A lot has been said about the world of torment. Well we see flashes of Hell in Song. We get another glimpse in Liefdom, but in the book Crown, we actually get to travel through it. Since my Southern Baptist upbringing days, I’ve been mildly obsessed with the throne of evil, and Crown shows part of my interpretation of Hell. The series that comes after this one is called The Madness Wars, where we get more of Aaron and we see the events that led up to the prison break that takes place in Song. We’ll get the first book in that series October 5th, 2019. There’s a lot of stuff coming, so keep your head on a swivel, and a weathered eye on the horizon, because I’m comin’ for ya.